Once upon a time, the great state of North Carolina was home to seven common-carrier (essentially, government regulated) narrow gauge railroad companies, as well as a number of private narrow gauge lines as well. One of the last to be built- the Lawndale Railway & Industrial Company- was also one of the last surviving narrow gauge railroads. 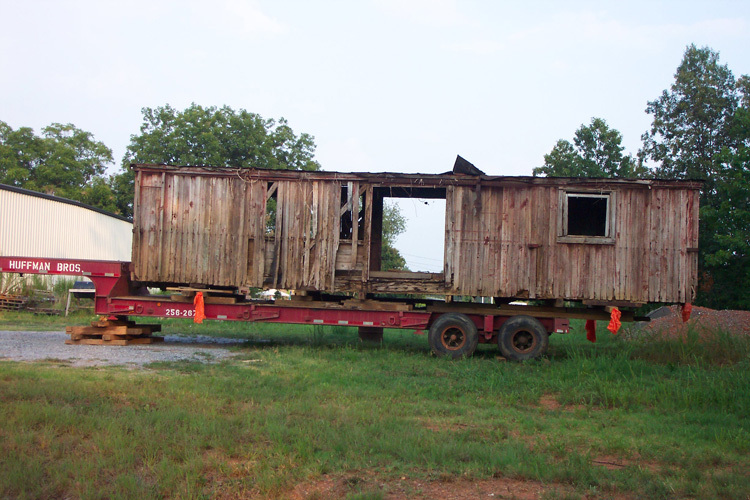 From 1899 until 1943, the "Lawndale Dummy" plied the tracks between the mill village of Lawndale and the small town of Shelby, North Carolina. At the end of the railroad's days, equipment was sold or otherwise scrapped. 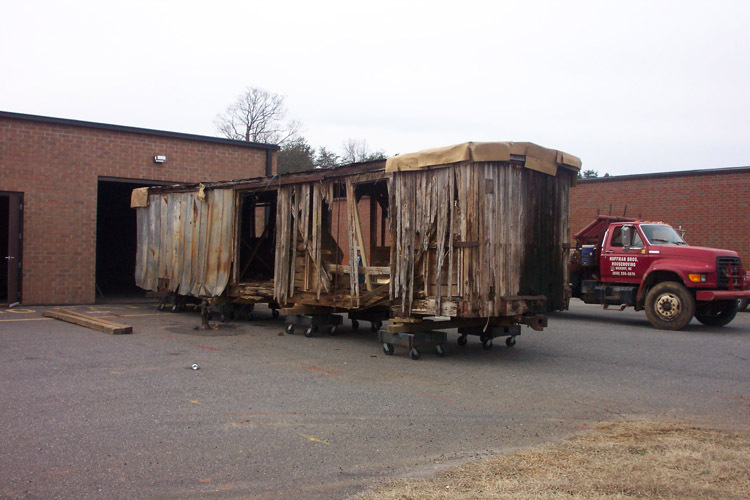 Fortunately, most of the line's boxcars survived the initial scrapping, and many of them were distributed to farmers or individuals in the community. 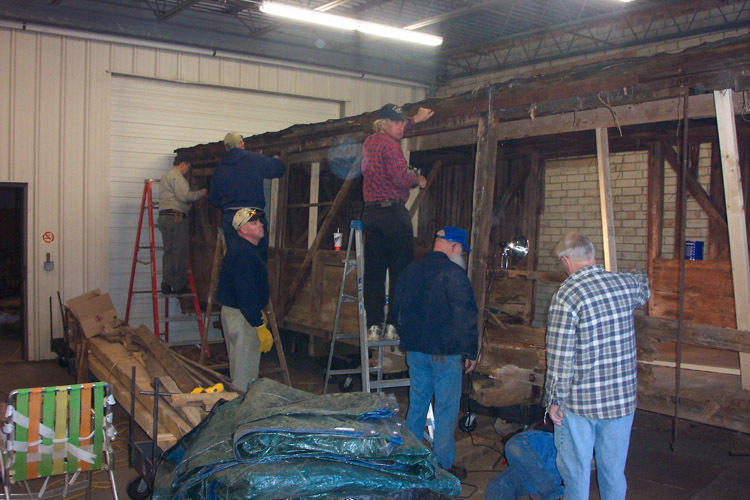 In November, 2006, at a meeting of the Alexander Chapter of the National Railway Historical Society, a new chapter member brought a friend to the meeting, and he mentioned that an old boxcar existed on his father's farm near Lawndale. After some questioning and investigating, it was indeed found to be a Lawndale car that had previously been unknown, and it had been sold or given to the family sometime after World War II. The family donated the car to the chapter, and thus began a saga which will lead to the formation of the North Carolina Narrow Gauge Museum (more on that later). 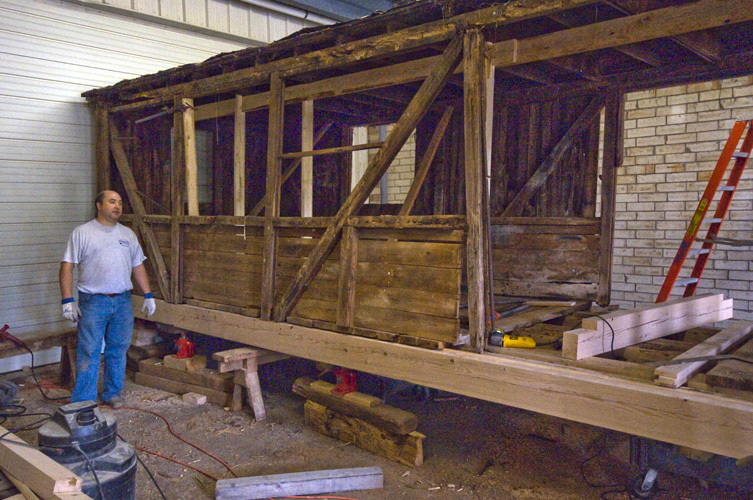 However, for the greater part of the past eighteen months, the faithful members of the Alexander Chapter have meticulously been preserving, restoring, and rehabilitating the Lawndale car using only the finest materials available, with custom cut wood, special-order hardware, and the same techniques that were used to build the car a century ago. See the unfolding saga in the photos below, and be sure to check back often. Is that a boxcar, or a honeysuckle covered hill? The Lawndale car sits completely unnoticed from the road and perfectly camoflauged for decades from unsuspecting passerby. 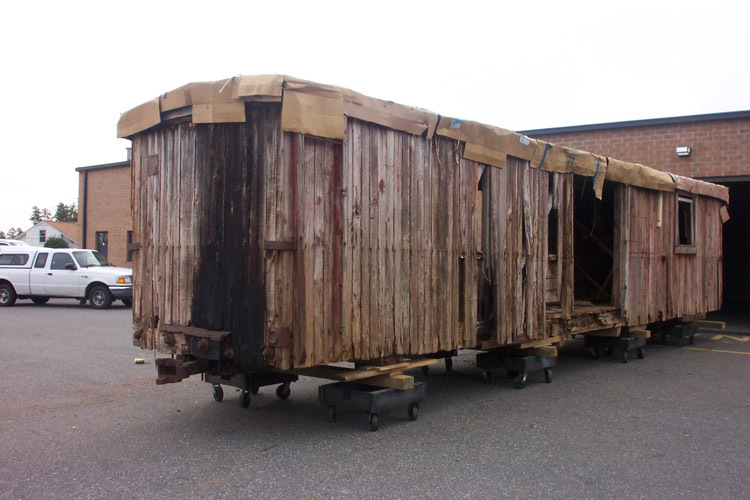 The backside of the boxcar is more protected from the elements and still has the door and hardware. 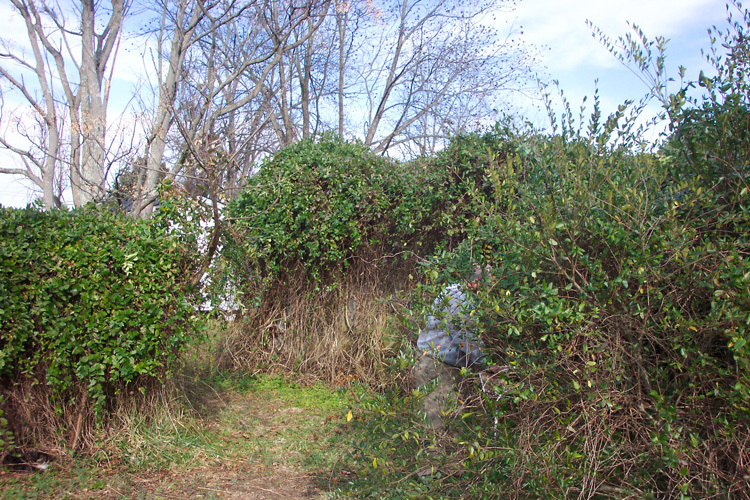 The chapter has a treasure-digging day and we remove the vegetation from around the car and see what we have to work with. 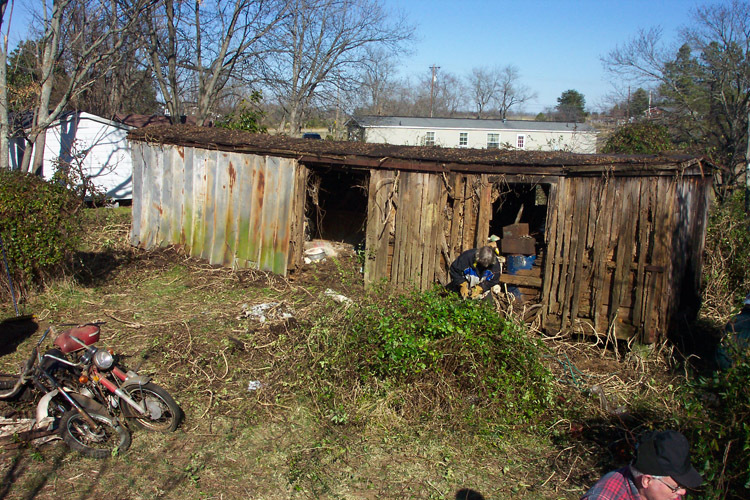 One quarter of the car is completely rotten and eaten by termites, and both outside sills are shot. However, the entire roof/ceiling had not leaked in fifty years, 75% of the interior walls were in good shape, as was half the flooring and all of the center and intermediate sills. It took some time, but we finally got the car moved the 50-odd miles from Lawndale to our repair facility in Oyama, NC, halfway between Hickory and Conover. We took a few months off to raise funds, get a grant, and order most of the replacement timber, but we did keep the car covered while it was outside. On this day, we put some industrial dollies under the car and moved it inside for the heavy work. This view shows the worst side of the car. 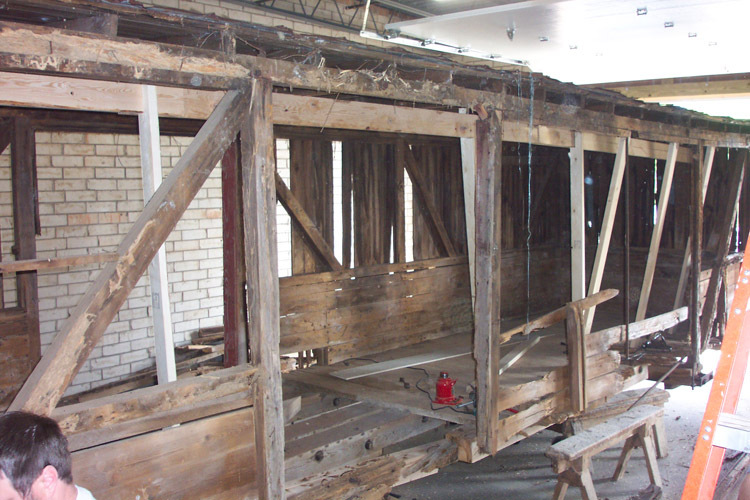 The car is now indoors and we have removed all of the siding on one side of the car, as well as the rotten interior bridging and interior wall bracing on the deteriorated quarter of the car. We opted to not monkey with the exceptional roof, so a temporary support structure was necessary after we removed the rotten bracing. The other side of the car was much better protected from the weather than the other. We also began to remove one of the terribly rotten side sills and the needle beams. In many ways, carefully deconstructing and documenting the car has been one of the most time consuming tasks of the entire project. The car is mostly deconstructed on one side. 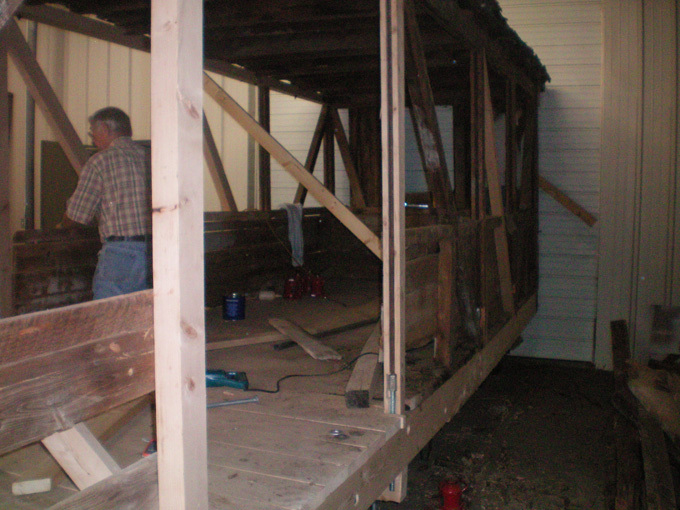 Now it is ready for some replacement timbers, and the side sill. 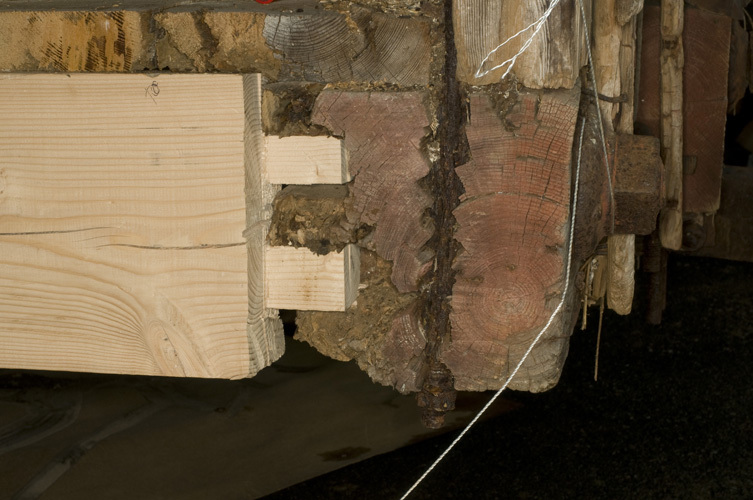 Most of this construction is done entirely with mortice and tenon style construction, and it was faithfully done in this car's restoration (see below). Three work sessions and a month later, we have set the first side sill. 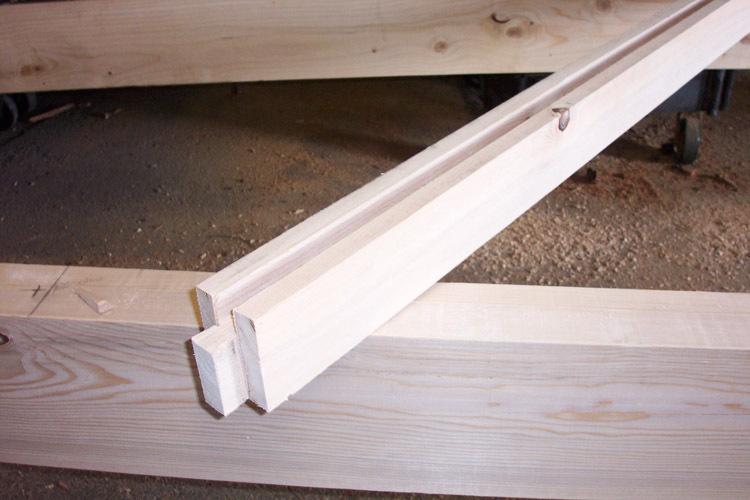 This included its tenons on each end (see below), and the mortices for all of the wall bracing. This part of the project also required us to precisely locate and drill holes and splice the vertical tension rods with new threaded rod. Needle beams have been cut as well. 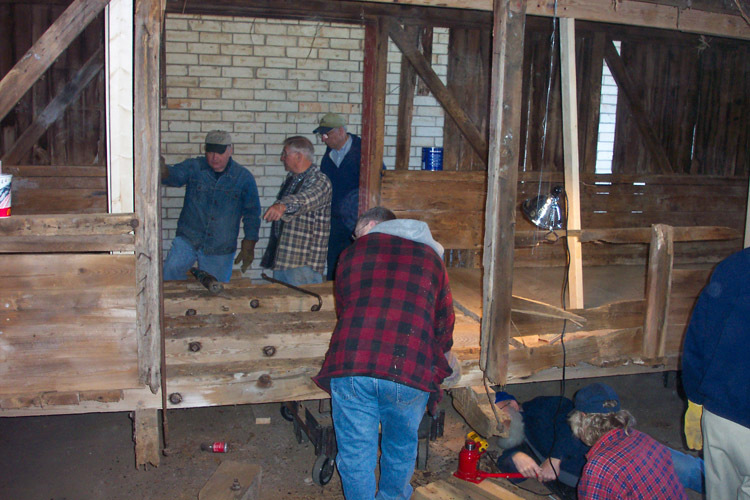 At right, much of the month was spent putting in the mortice & tenon wall bracing, and the tension rods. The temporary roof supports inside the car is almost ready to come down. 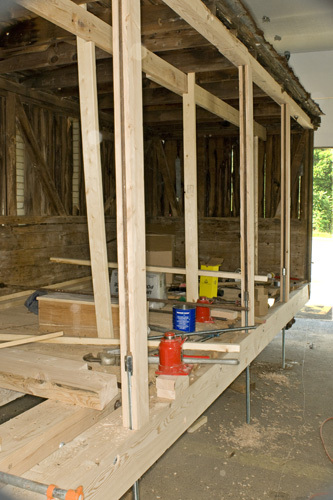 The last two months saw the installation of the side sill on the other side of the car, as well as the finishing of the interior wall bracing that had to be completed. (Right) The other side of the car was in far better shape than its opposite. Other than the side sill, and interior door supports, only one wall beam needed replacing, and that was due to a window that had been cut. 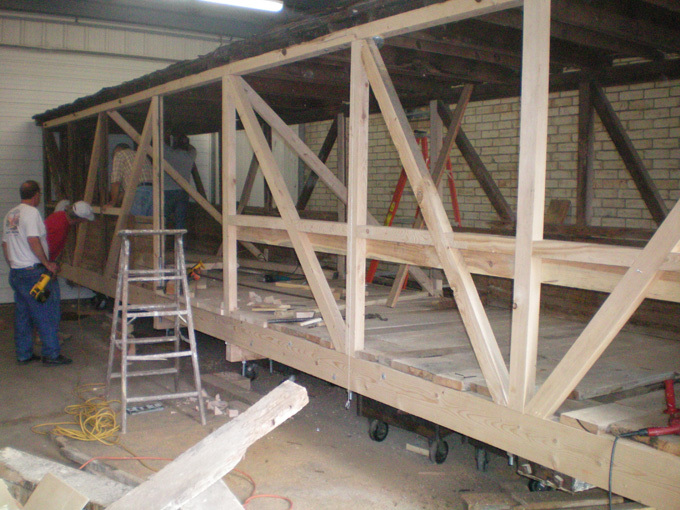 At the end of this day, all but two of the floorboards and one of the interior walls had been completed. 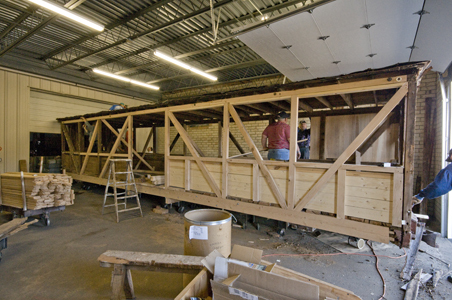 (Above) The internal framing on the car was completed in October. Thanks to George Ritchie, our wood-working leader, custom knives were made that duplicated the original beaded tongue-and-groove sideing exactly. 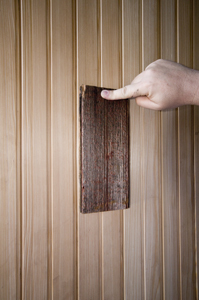 (Right) Though more expensive, the chapter used Cypress wood for the siding due to its excellent expansion/contraction resistance in terms of humidity and temperature extremes.